The last in the highly popular boy racer franchise, it follows on from the previous episode. After Dominic Toretto and his crew helped take down Owen Shaw, his brother, Ian Shaw, wants revenge. Expect more fast cars, fast women and breathtaking stunts. This film is releasing in regular and IMAX versions, this is the regular version. 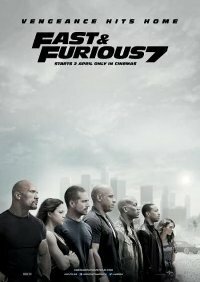 It was released as just 'Furious 7' overseas. This was Walker's final role.